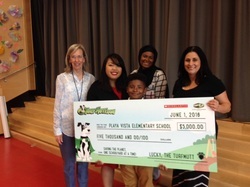 Congratulations to Ali Tomlinson, who won TurfMutt's national "Be a Backyard Superhero" contest and a $5,000 to improve the green spaces at Playa Vista ES! The contest is part of the TurfMutt environmental stewardship and education program which teaches students in grades K-5 backyard science and how to take care of green spaces. Through hands-on science activities, superheroes TurfMutt & the Outdoor Powers (Professor Botany, Water Warrior, Big Rooty, Green Ranger, and The Oxygenator) are used to teach students the importance of living landscapes. The TurfMutt character is based on a real-life rescue dog named Lucky. Ali won the national K-2 prize with his TurfMutt character-inspired artwork and his story entitled "Teamwork Makes the Dream Work", in which TurfMutt & the Outdoor Powers saved a neighborhood. Ali read his story and received the ceremonial check on June 1, 2016 at an assembly at Playa Vista ES. The school also received a banner to display this Sustainability Star's proud achievement! Porter Middle School & Westchester Enriched Sciences Magnet Earn Gold from CA Green Ribbon Schools! 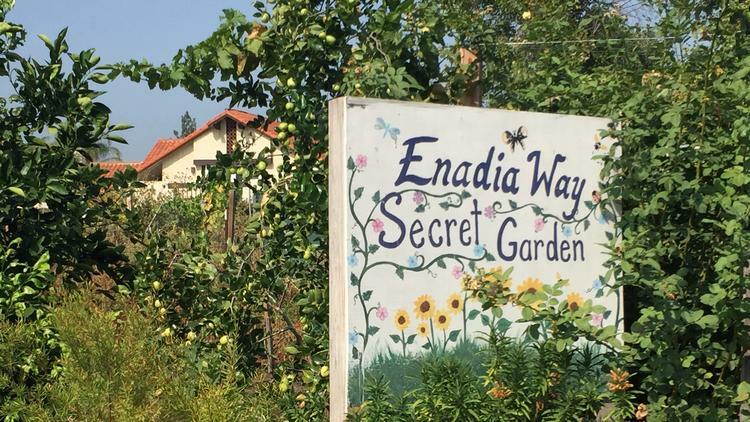 Congratulations to Porter MS and Westchester Enriched Sciences Magnet for earning Gold recognition from the California Department of Education's Green Ribbon Schools program! Their achievement was announced February 26, 2016 by State Superintendent of Instruction Tom Torlakson. Green Ribbon Schools demonstrate exemplary achievement in three “pillars.” Pillar I: reduce environmental impact and costs; Pillar II: improve the health and wellness of schools, students, and staff; and Pillar III: provide effective environmental education that teaches many disciplines and is especially good at effectively incorporating science, technology, engineering, and mathematics (STEM) education, civic skills, and green career pathways. Special kudos to Teachers Curtis Ward from Porter MS and Kazumi Igus and Joseph Starks from WESM! 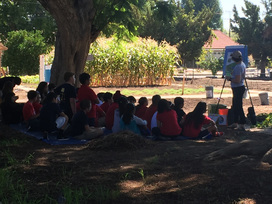 For more information, please visit the California Department of Education's Green Ribbon Schools Award Program Web page and download A Blueprint for Environmental Literacy: Educating Every Student In, About, and For the Environment.